Brussels sprouts, as we know them now, were grown possibly as early as the 13th century in what is now Belgium. They say that before that, the forerunners to modern Brussels sprouts were likely cultivated in ancient Rome. They came to North America in the 18th century, when French settlers brought them to Louisiana, which is a good thing because Brussels sprouts, as with broccoli and other brassicas, contains sulforaphane, a chemical believed to have potent anticancer properties, not to mention that they contain good amounts of vitamin A, vitamin C, folic acid and dietary fibre. When boiled they loose some of their amazing healing power so why boil them? 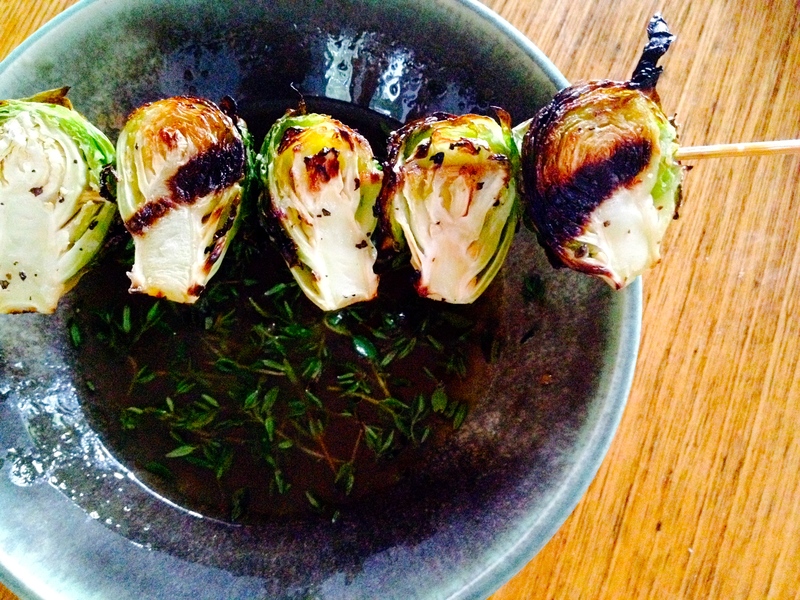 Grill them on the BBQ instead with a little thyme lemon dipping sauce on the side. Preheat the BBQ. Thread halved Brussels sprouts onto metal or wooden skewers. Brush with olive oil and sprinkle with sea salt and freshly ground pepper. Grill over medium-high heat until still firm but tender and nicely browned, about 5 minutes each side. While the Brussels sprouts are cooking, whisk together lemon juice, maple syrup, olive oil, and thyme in a small bowl. Set aside. When ready, arrange sprouts on a platter. Serve warm with the dipping sauce at the ready. We had a potluck dinner at my parents’ house the other day for my dad’s birthday. My sister was organizing it and decided to make sweet and sour tofu stir-fry as one of the main dishes; she asked me to bring a side. I had a pile of brussels sprouts that needed to be used up and decided to do an asian-inspired sprouts and ‘shroom dish with crispy shallots on top because after making them for the basmati and wild rice dish with chickpeas, currants, and herbs, we just can’t get enough. Deep flavours, different textures, roasted yumminess. Preheat oven to 375 degrees. Shave or slice brussels sprouts finely with a knife or mandolin. Add them to a a oven-proof baking dish. Toss with olive oil and minced garlic and bake for about 20 – 30 minutes until they are cooked through (this will depend on how thinly they are cut). Meanwhile, chop mushrooms into strips. Cook in a skillet over medium-high heat until they begin to brown and release their juices. Once cooked, add tamari sauce, rice vinegar, and sesame oil. Let the mushrooms cook in the tamari mixture for a few moments to let the mushrooms soak up the liquid and to let the flavours meld. Toss the mushrooms with the brussels sprouts. Add sea salt and pepper to taste. Set aside. Heat sunflower oil in a heavy skillet until quite hot. Slice shallots into rings. Toss in the flour. Add shallot rings to the hot sunflower oil and saute until they are golden brown. Remove with a slotted spoon onto paper towel and let cool. Cook in batches so that the shallots brown evenly. Garnish brussels sprouts and mushrooms with crispy shallots and serve warm. 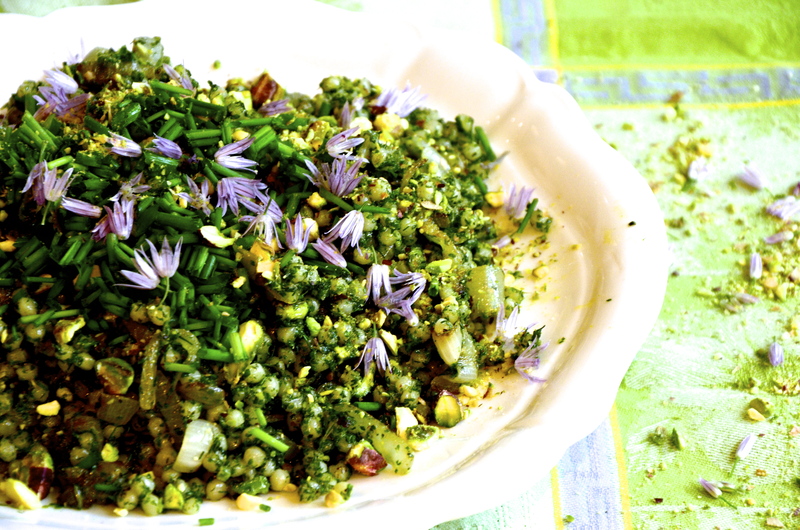 Today is Thanksgiving Day and I’m making this stuffing in honour of all that I’m thankful for. Thankful? Let me count the ways: fall’s bounty; the healing power of herbs; collective flavours that are oh so much more than their individual parts; being stuffed with food grown by friends, shared with friends, and eaten in friendship; for Marci Babineau who was the originator of this recipe in yesterday’s Globe and Mail; and for the fine art of veganization that turns all good recipes into a showcase for a vegetable-based diet. For all of this, and more, I’m truly grateful. Heat olive oil over medium heat in a large skillet. Add onion and cook for about 8 minutes or until the onion is soft. 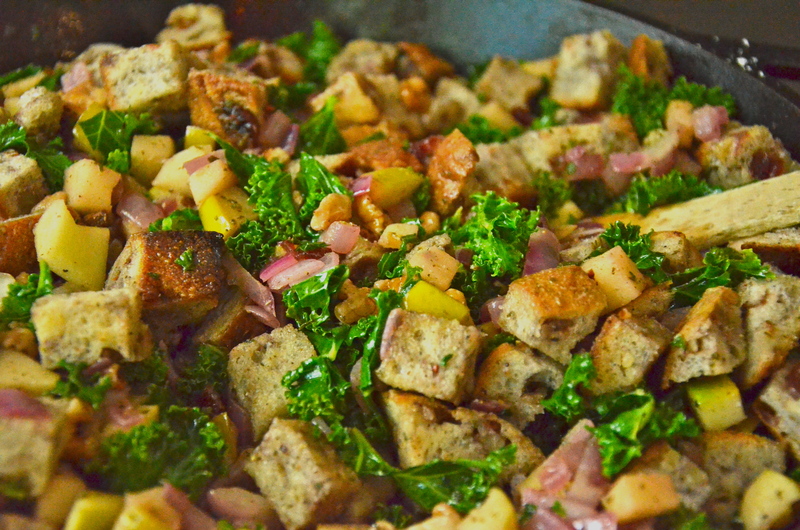 Add apple chunks, sage, kale, and walnuts and cook for about 2 minutes. Stir in apple cider vinegar and remove from heat. Put bread chunks in a large bowl and stir in onion mixture. Add sea salt and pepper to taste. Spoon stuffing into a baking dish and pour stock over it. Bake until the top is browned (about 20 minutes). Wendall Barry – a brilliant author/poet/thinker – wrote “We live the given life, not the planned.” Today I must agree. What I had planned was a vegan clafouti with carefully researched options and sourced ingredients. 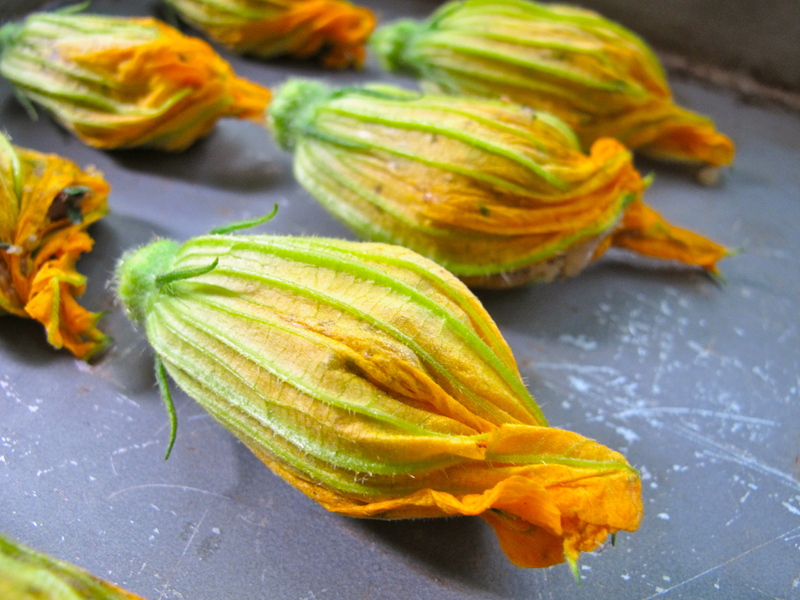 What I was given was some gorgeous zucchini blossoms fresh from the vine. The gift inspired me, I cooked up some savoury stuffing, and friends and family around the table fought over the last blossom of delight. 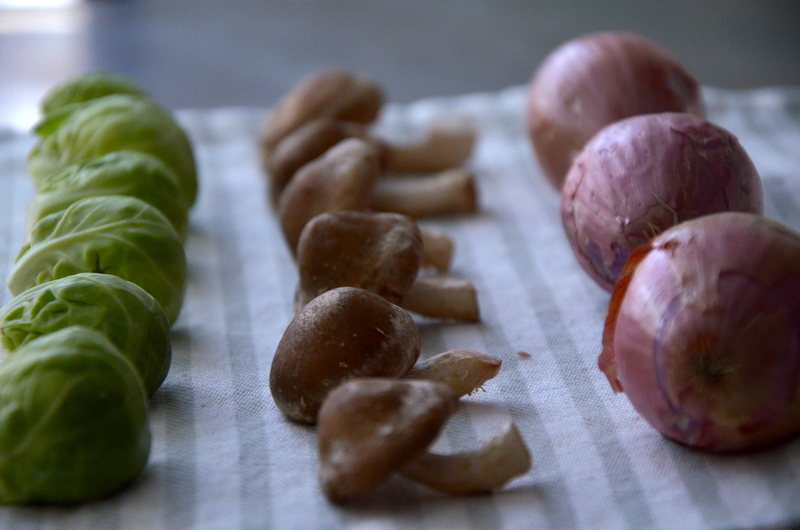 These are delicate, interesting, uplifting, and versatile enough to go with any of your best-loved dishes. Check out your local farmers’ market and stuff away! Heat olive oil in a heavy bottomed skillet. Add onion and sauté until soft and translucent. Add garlic and sauté another minute or two until garlic is fragrant. Add chopped capers and olives. Add quinoa and panko. 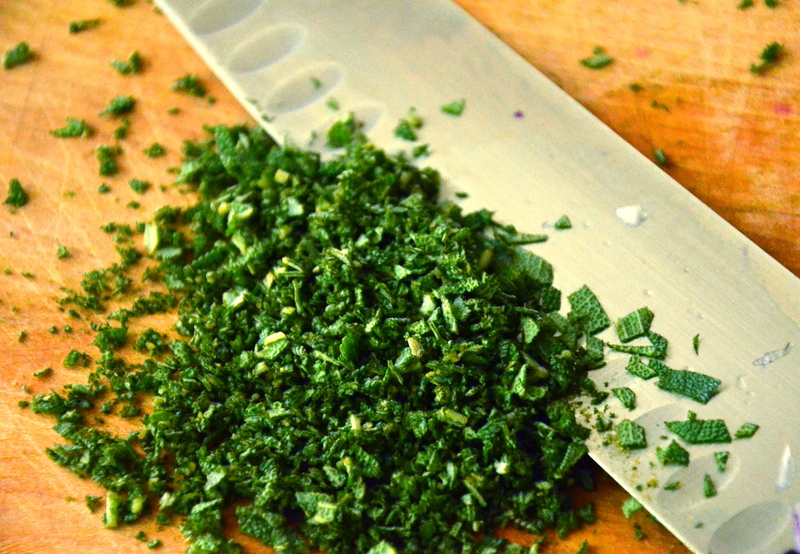 Add fresh herbs as well as salt and pepper to taste. Let all the ingredients simmer away for a few minutes until well blended and cooked through. 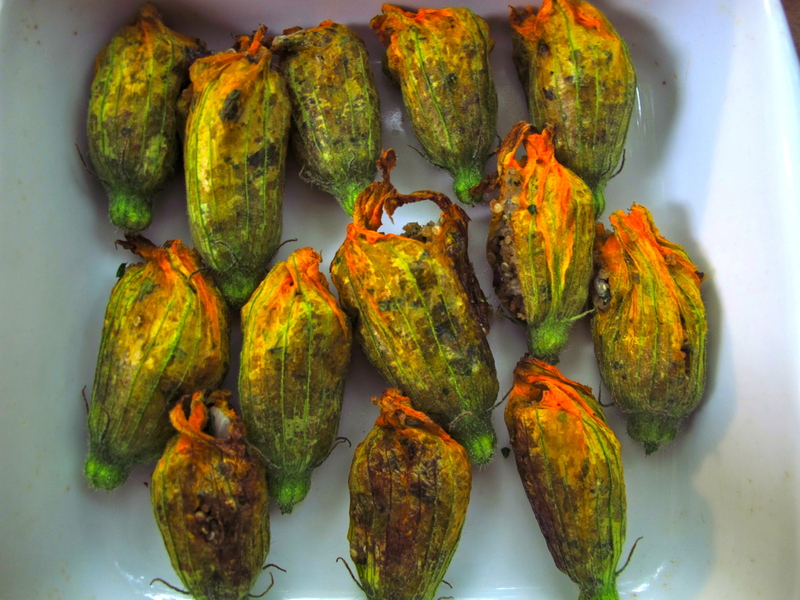 Meanwhile, trim the stem at the bottom of the zucchini blossom. Carefully remove the stamen from inside the flower being careful not to rip the delicate flower. Add approximately 1 – 2 tsps of stuffing to each blossom and then twist the ends to seal in the goodness. Place stuffed blossoms on a cookie sheet and bake in the oven at 350 degrees for approximately 20 minutes.